Located on the slopes of the Val di Trebbiola, in the province of Piacenza, the company La Stoppa has been operating for about a century in the wine sector, distinguishing itself for its almost philosophical approach towards genuineness, respect for the territory and the enhancement of old vineyards. 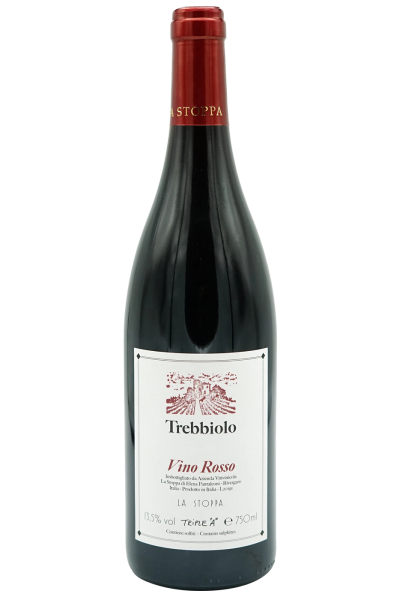 Among the wines produced, Trebbiolo Rosso represents the typical expression of Colli Piacentini, the son of the encounter between two native vines, Barbera and Bonarda, reared according to the dictates of organic farming and without undergoing sophistication in the cellar: spontaneous fermentation with maceration on the skins for about 20 days using only indigenous yeasts, stopping for 10 months on the fine lees in steel and minimum use of sulphur dioxide. A straight wine, which offers a gourmand, articulate and intense sip, with particular elegance, perfect for conviviality. At sight it is bright ruby red, full of vivacity. Fragrant sensations of red fruit, flowers, humus and vegetal nuances, capture the nose and unfold towards more decisive notes with oxygenation. The taste is fresh, beautifully structured, characterized by a lively tannin, but not intrusive and well integrated. Good final persistence, fresh and fruity aromas return perfectly matched to the nose. Excellent companion throughout the meal, it is ideally suited to first courses and platters of meats and cheeses. To try with pizza.